The Dignity Health Foundation – East Valley funds athletic trainers and sports medicine coverage to high schools in the East Valley. 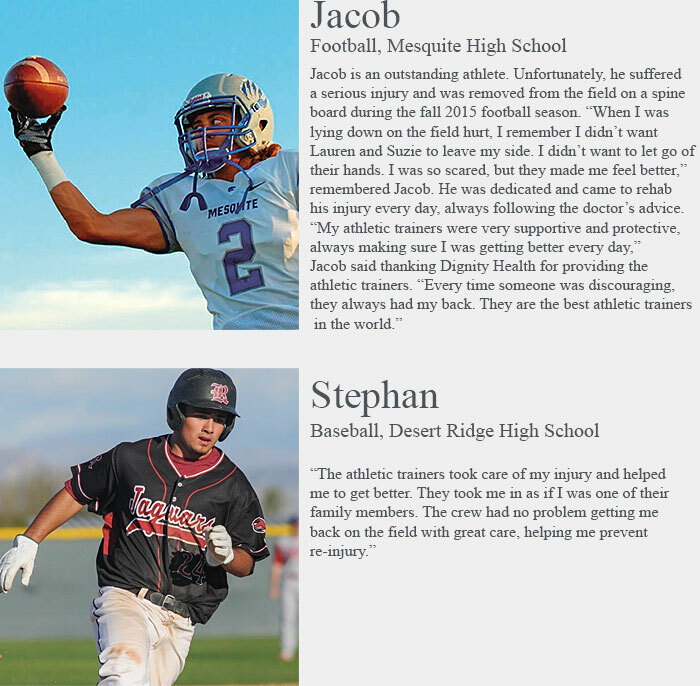 The Dignity Health sports medicine program provides sports injury care including the prevention, emergency care, clinical diagnosis, treatment, and rehabilitation of injuries and medical care to high school athletes. Injuries are a part of the game and they can be serious. Therefore, the athletic trainers collaborate with physicians and are responsible for providing preventative training and education as well as medical care at all high school sporting events and trainings. They also partner with the schools to train student aides. Athletic Trainers are a key link between the entire team: parents, athlete, coaches, administration, nurses, therapists and physicians. In the summer of 2015, the athletic trainers in the Gilbert Public Schools delivered a collaborative cervical spinal injury training program to prepare for the new school year and athletic season. If a student athlete suffers a spinal injury, the care becomes methodical, it starts with the coaches and athletic trainers who hand off care to the emergency medical services personnel and then to the Emergency Department. Each step is vital to helping the injured athlete. "Often the coaches, especially the athletic trainers, are at the front line of these injuries. They're the ones on the field and at the gym when the injuries occur and that's often the times when you can make the biggest difference, if the athlete gets the most appropriate cervical spine care," said Dr. Matthew Hansen, Medical Director for the Sports Medicine Program. Throughout the training, orthopedic physicians and athletic trainers spent time going over the protocol, demonstrating how to respond to a cervical spine injury, and allowing all specialties to practice responding to these injuries. They practiced leg rolling maneuvers with volunteers acting as injured players, rolling onto backboards, slow and steady. "The key part of our job is to be ready and know exactly what to do when stuff goes wrong or an athlete gets injured," said Suzie Squires, Dignity Health Athletic Trainer. Notably, there was a football injury that occurred just three weeks after the Dignity Health Sports Medicine Program held the educational event for athletic trainers, coaches, student-aides, and Gilbert Fire regarding appropriate care of spine-injured athletes. The athletic training teams on-site for the injury (both home and visitors), and the Gilbert Fire squad that arrived, were all in attendance at this event. As a result, the entire team was already familiar with each other and provided extremely cohesive care for this athlete.